"We would like to express our deepest sympathy to all of our friends and neighbours in the United States due to the horrific events that have recently occurred in New York, Washington and Pennsylvania. Our hearts and prayers go out to all the families who have lost someone dear to them." 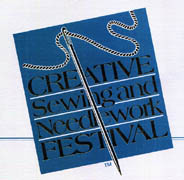 The Creative Sewing and Needlework Festival always gives the public exactly what it wants! That promise alone should entice stitchers to attend this gala event. 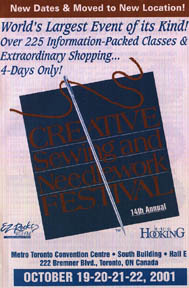 For 14 consecutive years this festival has been showcasing the latest tips, trends and techniques from the sewing, needle art and crafting industries. In more recent years, it has achieved international recognition attracting visitors from across Canada and as far away as the Caribbean, Europe, Africa, Australia and just about every state in the USA. Armed with a single idea and an abundance of determination, former banking executive Rita Gramsch launched the Festival in 1988. 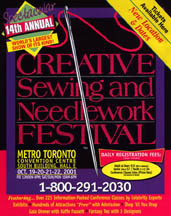 Starting with an attendance goal of 10,000, the first Creative Sewing & Needlework Festival attracted some 18,000 enthusiastic consumers who lined up on a cold October day, long before the doors opened, all eager to see, try and buy the latest sewing and needlework techniques, equipment and products. And that was just the beginning! Today, this event is held twice a year in the Toronto area, has more than doubled its initial attendance and expanded the ever popular and growing Conference component. Hence the need to relocate this year's festival and future fall events to the Metro Toronto Convention Centre, in the heart of Toronto's entertainment district. Here they will offer over 235 classes as well as an information-packed lecture series by world-class instructors. A distinctly different and new format will be introduced at future spring events at the International Centre, Mississauga, beginning with the Festival scheduled from April 19 - 21, 2002. While growing every year, the emphasis of this event has remained on sewing, knitting, quilting, needlework and crafts for both personal fashions and home décor. Showcased is what's hot and new in: Fabrics, Yarns, Notions, Trims, Accessories, Patterns, Machines, Kits, Books, Videos, Supplies, Tips, Tricks & Techniques for: Appliqué, Bargello, Beadwork, Battenberg Lace, Bear Making, Blackwork, Bobbin Lace, Bowmaking, Brass Embossing, Braiding, Bridal Lace, Calligraphy, Canvas Work, Ceramics, Colourwork, Crafting, Crazy Patchwork, Crewel, Crocheting, Cross Stitch, Decorating, Doll Making, Embellishment, Embossing, Embroidery, Entrelac, Fabric Dyeing, Faux Finishing, Fashion History, Florals, Folk Art, Knitting (Hand & Machine), Hardanger, Heirloom Sewing, Intarsia, Interior Design, Jewelry Making, Lace Making, Lampshade Making, Leather, Needlepoint, Needlework Designing, Paper Arts, Paper Piecing, Paper Tole, Pattern Drafting, Pergamano, Petit Point, Pressing, Pulled Work, Quilting, Ragged Rugs, Ribbon Crafts, Rubber Stamping, Rug Hooking, Scissor Sharpening, Serging, Sewing, Silk Ribbon Embroidery, Scrapbooking, Smocking, Soapmaking, Software for Crafts, Spinning, Stenciling, Stumpwork, Surface Embroidery, Tatting, Weaving and Sewww Much, Much, More! Whether it's traditional handwork or the latest in high tech computerized software, equipment & techniques, you'll find it there! There's truly something for everyone beginners & experts alike! The Festival includes over 500 displays, hundreds of presentations and more than 200 classes by celebrity instructors from all over the world. Also presented will be as many as 10 different fashion shows, all sorts of door prizes, media sponsors and much more. The Fall Festival is the world's largest consumer show of its kind. It has become a forum for expert advice and instruction in all the traditional needle arts and crafts as well as featuring the newest in computerized technology and timesaving tips. Teresa has prepared a class teaching her exclusive new design, Celtic Inspiration Band Sampler. In this class you will explore techniques and fibres as you cross-stitch this captivating miniature band sampler. Using Caron Watercolours fibre, Kreinik metallic cord, Mill Hill glass beads and DMC rayon thread, try various specialty stitches including Satin stitch, Lazy Daisy and Eyelet to create interesting Celtic inspired motifs. In another class, Teresa will share secrets to stitch complicated-looking cross-stitch designs. From de-mystifying the chart, floss organization, blending, fractionals, using metallics, adding beads, tips for stitching over-one to basic specialty stitches, discover this and more. Never be intimidated by a design again! For the October show, for the first time ever, attend an exclusive co-presentation by 3 internationally acclaimed needlework fantasy designers. An exciting collaboration of the 3 top dragon designers: Teresa Wentzler of TW Designworks, Jennifer Aikman-Smith of Dragon Dreams and Karen Weaver of Black Swan Designs have combined forces to create this design, an undertaking that has been 2 years in the making! What is it like to create worlds of wonder with your imagination? Join three legendary fantasy designers; Karen Weaver, Jennifer Aikman-Smith and Teresa Wentzler for an evening of wit and whimsy as they share their experiences over tea and tempting sweets. Learn to customize and alter patterns, create your own designs, approach editors, self-publish your own patterns and much more. Receive a memorable keepsake, a chart of a tiny dragon "Spot," peaking out of it's teacup, designed just for this special event! The Quilt of Belonging, a national Invitation textile art project, is the brainchild of visual artist Esther Bryan of Ontario. Born of the recognition that the Canadian fabric is a patchwork of aboriginal peoples and immigrants from every nation of the world, when completed, the quilt will contain some 280 individual blocks. Join Esther for a light continental breakfast and slide presentation. For centuries, textiles have expressed an individual's and country's history, culture, traditions, geography, philosophy and faith. Discover how unique traditions from around the world will form this Canadian tapestry! This partnership is dedicated to promoting the art and heritage of quilting. It will be a rare opportunity to admire the remarkable quilt styles of Denmark, Finland, Norway and Sweden. On display will be the quilt art of various textile artists among them European Quilter of the Year, Authors, and World Class Teachers. The quilts use many different fabrics and materials from chiffon to horsehair to fun-fur and are both machine and hand-quilted. "The quilts are a mix of contemporary and traditional quilting and other techniques and applications. 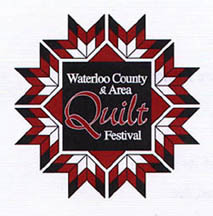 The collection is truly one-of-a-kind," comments Carolyn Dysart, Waterloo County & Area Quilt Festival Chair. Kenneth King will teach the winners a workshop on The Moulage: French Couture Pattern Drafting. The moulage is a form-fitting pattern that precisely duplicates the figure. Designed for the experienced sewer or custom dressmaker, this exclusive presentation promises to be lots of fun, as well as a rare learning opportunity. Kenneth began by making Barbie clothes as a child and today, designs clothes for the likes of movie star Geena Davis and pop singer Elton John. KAFFE FASSETT presents "Fresh Ideas from the Past"
Kaffe Fassett, awe-inspiring artist and colourist, is the first living textile artist to have a one-man show at London's Victoria and Albert Museum. A visual presentation that epitomizes Kaffe's mastery of his craft, through the use of vibrant, intense colour will be one of the outstanding highlights of the festival. Be it mosaic, collage, theatre design, fabric, needlepoint or knitting and his latest passion - patchwork... witness his rich and daring use of colour. Featuring slides of past designs and highlights from his latest book - Passionate Patchwork! Rita Gramsch is constantly adding exciting new elements to the festival line-up. She pays very close attention to those attending the festival, seeks out their views and is always prepared to change with the times. She works hard to present a broad range of needle art categories, ensuring the right mix of sewing, knitting, quilting, spinning, weaving, embroidery, needlepoint, petit point, cross stitch, crocheting, lace making, paper arts, rug hooking, florals, stenciling, crafting and more. She has also expanded the needle arts categories with special displays, crafts and more stitchery. 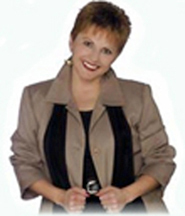 She has continuously encouraged exhibitors to present more demonstrations, attracted new national media sponsors, added Celebrity Expert lectures and workshops, and in the early '90's took the festival to six other cities across Canada: Vancouver, Edmonton, Winnipeg, Ottawa and Halifax. "The key to our success," says Gramsch, "is that consumers know there will be a huge range of products all together under one roof. My greatest challenge is to continue to meet the high expectations of consumers and exhibitors by ensuring that the festival is fresh, alive, exciting and new!" Whether it's traditional handwork or the latest in high tech computerized software, equipment & techniques, you'll find it there! Don't miss this opportunity to experience a show unlike any other! We would like to credit and thank International Showcase Associates, Inc and the staff of The Creative Sewing and Needlework Festival for providing the information for this feature story.